After reviewing concerns expressed about the Inner Arbor plan, it’s now time to take a closer look at the proposed design. Andrew Metcalf has done a great breakdown of the proposed design for Columbia Patch. I’ll try not to duplicate his work, but rather provide some color commentary to complement his play-by-play. First, I think it’s important to properly set expectations. Many people, including Ken Ulman in his recent comments, have been comparing the Inner Arbor plan to iconic parks like Millenium Park in Chicago (part of Grant Park and home to Anish Kapoor’s famous Cloud Gate sculpture), New York’s Central Park, and Tivoli Gardens in Copenhagen. I think this is an understandable but perhaps unfortunate exaggeration of what the Inner Arbor plan might evolve to be. To take but one example, Millenium Park cost almost half a billion dollars to build, and was a financial stretch even for a major US city of several million people. The Inner Arbor plan has to be funded in a county of 300,000 people with few large corporations and no resident billionaires; this phase is projected to cost in the neighborhood of $30M or so, with about a tenth of that committed thus far. We’re not talking Millenium Park, but more something that’s in the spirit of Millenium Park but scaled in cost and ambition appropriately to Columbia and Howard County. The selected design team also has to be judged in that light. The amount of funding and the associated ambition of the design is not sufficient to attract designers and architects who are household names. In other words, we’re not getting Frank Gehry back to design something for Columbia again. But that’s OK: When Gehry designed Merriweather Post Pavilion and the Rouse building he wasn’t “Frank Gehry, star architect”, he was just a young(ish) architect with talent who was looking to get his designs built and make a name for himself.1 Unfortunately I wasn’t able to attend the meeting in which the design team was introduced, but based on a few minutes of googling it looks as if Eric Bunge and Mimi Hoang of nARCHITECTS and Marc Fornes of THEVERYMANY in particular fall in that category as well. Everyone on the team seems to be doing good work elsewhere, and they appear well-qualified to take on these commissions. 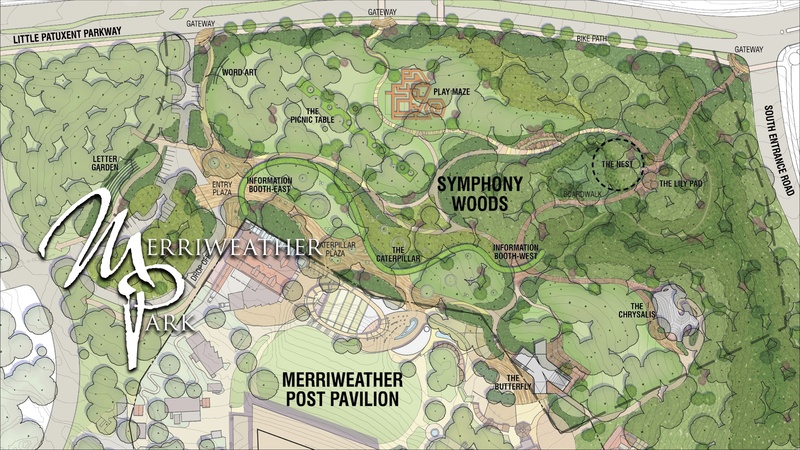 Turning to the design itself, let’s first consider the overall master plan for what the Inner Arbor Trust is calling “Merriweather Park”—essentially a rebranding of the combination of the existing Merriweather Post Pavilion and the proposed new Symphony Woods. Note that this phase of the plan does not address the entire area covered in the original Inner Arbor conceptual plan. It focuses on the northern Symphony Woods parcel (about 16.5 acres) and its relationship to the Merriweather property, and leaves out the eastern parcel (where the conceptual plan proposed an “arts village” and a new Columbia Association headquarters) and the southern parcel (where the conceptual plan included a proposed sculpture garden). The Merriweather Park master plan (click for a higher-resolution version). Image provided by the Inner Arbor Trust. At the pre-submission meeting the primary criticisms of the overall plan were that it lacked a central focus and that the structures were not stylistically consistent. (One person gave as an example of such consistency the design of Howard County parks such as Blandair, Centennial, etc.) To quote Cy Paumier, these critics felt that “there is no ‘there’ there”. The response from the presenters on the focus issue was two-fold. First, that the true focus of the area was and should be Merriweather Park Pavilion itself, given its central location and its status as the place that would continue to attract the most visitors. I happen to agree with this point, although as I noted in my last post treating Merriweather as the focus implies a fairly high degree of integration between the Merriweather property and the Symphony Woods property, and achieving this level of integration is ultimately dependent on cooperation from the Howard Hughes Corporation. If I recall correctly, a second response from the presenters was that the overall focus of Symphony Woods proper should be on the woods themselves, and that no single structure should pull focus away from them. I agree with this argument as well. I think one of the major flaws of Cy Paumier’s plan was that it attempted to impose a rigid geometrical layout (almost an English formal garden look) on the Symphony Woods landscape, to the point where the woods themselves became subordinate to the design. Whatever else what one might say about the Inner Arbor design, the meandering paths and spread-out structures (none truly massive) help ensure that it coexists with the woods rather than dominating them. As for the consistency argument, I think in one sense stylistic consistency is overrated. For example, Tivoli Gardens, which has been held out as a model for the Inner Arbor plan, is a mismash of different architectural styles, both from different periods in European history and from countries beyond. And as with the issue of focus, the woods themselves provide a consistent backdrop throughout the park, assisted by common elements such as wooden paths. The proposed structures within those woods and next to those paths provide what I think is a welcome variety. To have all those structures be stylistically similar to each other would be too much of a muchness. Finally, from a conceptual point of view the idea of metamorphosis (caterpillar to chrysalis to butterfly) does provide a common theme for the main structures, with all the structures recognizably paying homage to that theme even though their forms are very different. The proposed approach also has practical advantages. First, it means that the Inner Arbor Trust doesn’t have to put all its eggs in one basket in choosing architects and designers, entrusting the entire design primarily to one firm. Instead it can enlist multiple smaller firms, giving them freer rein and letting them experiment a bit within the constraints of the overall site landscape and design themes. I think this approach is far more likely to produce interesting results, and helps ensure that any bad design choices that might slip through don’t impact the entire park. Having multiple smaller structures of different styles could also make it easier for the Inner Arbor Trust to find sponsors willing to fund construction: The smaller size of the structures means that each individual park feature could be funded primarily by one individual funder (much as Howard County is funding the Chrysalis amphitheatre), and the stylistic variety would mean that each such funder would have a unique feature to highlight their contribution. Finally, since park construction would likely stretch over several years (up to one or two decades, according to Michael McCall), as each new structure is completed the public would have something new and different to experience, as opposed to just seeing more of the same. That concludes my discussion of the overall plan. In my next post I’ll discuss the proposed structures and other park features. UPDATE: Corrected the spelling of Andrew Metcalf’s name, corrected a reference to Frank Gehry’s age, and fixed a typo. It’s not unusual for architects to work many years before having any of their designs built. Frank Gehry was in his early thirties forties when he designed Merriweather Post Pavilion and the Rouse building; they apparently were his first commissions other than two private residences. Gehry didn’t become truly famous until his sixties, after the completion of the Guggenheim Museum in Bilbao, Spain. To take another example, current celebrity architect Zaha Hadid didn’t have her first projects realized (a housing development and a fire station) until her late thirties and early forties, and didn’t have a major building to her name until her early fifties, when the Rosenthal Center for Contemporary Art was built in Cincinnati.